Another few great days out in the Norwegian mountains. This time we headed a little further afield to Hurrungane, a sub area of the famous Jotunheimen region, a five hour drive from Oslo heading north-west (provided the road is open, otherwise add an hour to that). The mountains I’d seen in Norway up to this point had been rather on the tame side; old and rounded peaks, good for nice, cruisy touring and perhaps a little on the short side. Hurrungane is none of these things. It’s the real deal. Long runs of around 1300m. Technical and steep 50 degree couloirs. Glacial terrain. Everything you could pretty much ever want. It was a revelation! It’s not quite the European Alps but only not quite. The light was really flat when we arrived. But that was okay. I mean, what do you do when the light’s flat…? You ski the trees. And what do we do if there are no trees…? You ski couloirs! Ja da! 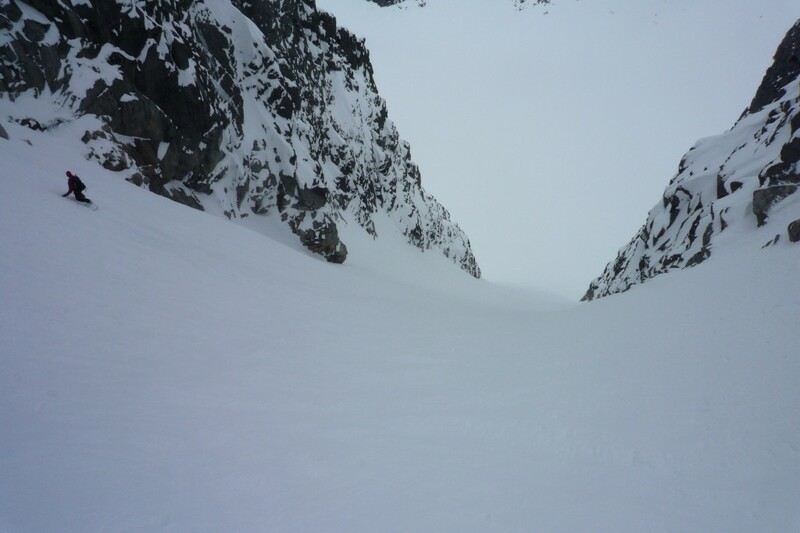 And luckily for us, there were a couple of couloirs on the agenda. 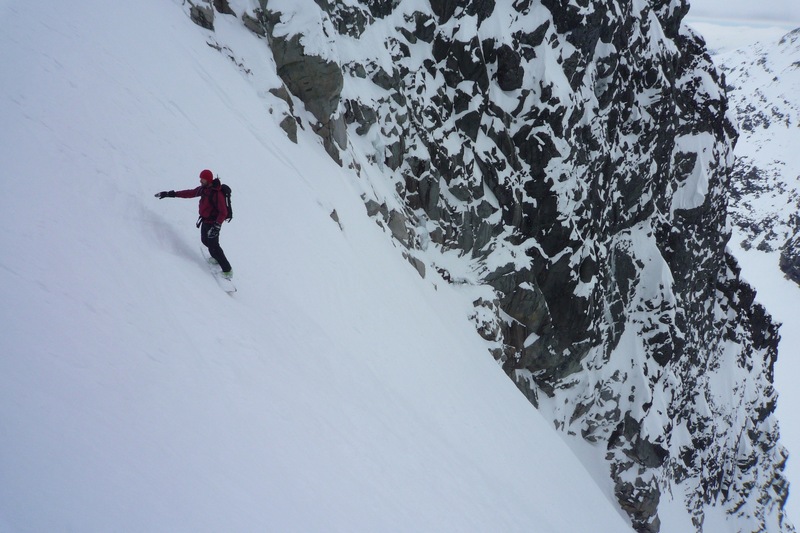 The west couloir on the Austabottind massif is really wide, evenly steep and just great fun. I’m guessing, excluding the fan, that the couloir is around 400m and at least 45 degrees (and not much more even though I have seen it rated at 50 degrees). This is a great and relatively quick tour to get to the entrance (we did it in a leisurely 1.45hrs) and the great thing is that you can link it up with the south couloir on Store Soleitind which is on the opposite side of the valley and where the above picture was taken. 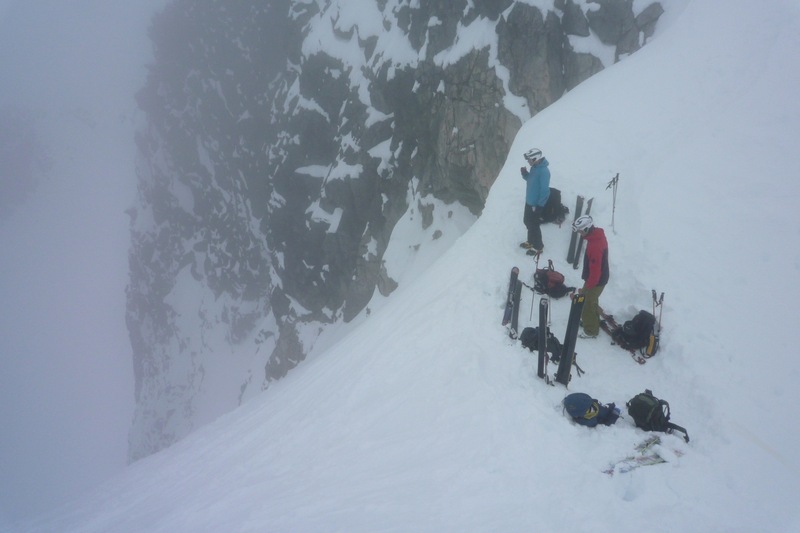 We skinned up the backside of Austabottind and scrambled along the ridge to the entrance without getting to take a look at the couloir first. The scramble is not that long (maybe 30mins, I cannot remember) and you cannot miss the entrance. If you see a cornice, keep going. 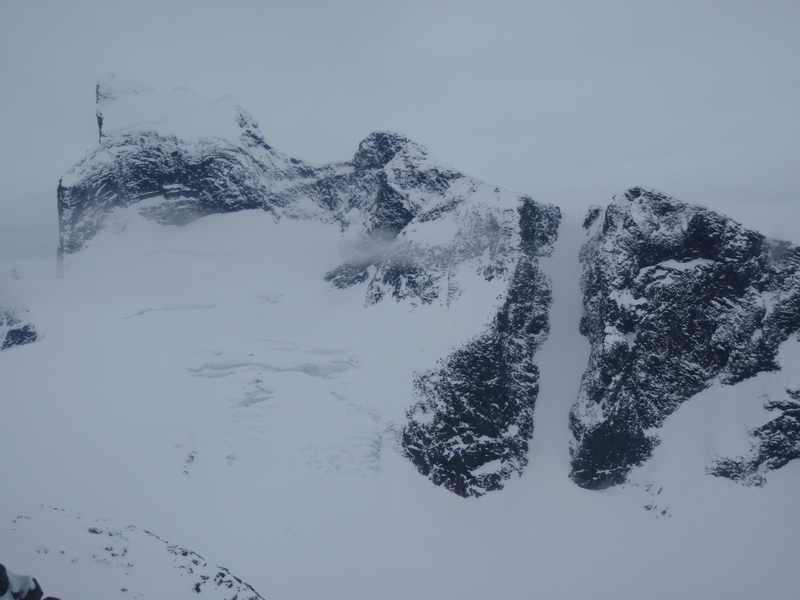 There is no cornice formation on the entrance. 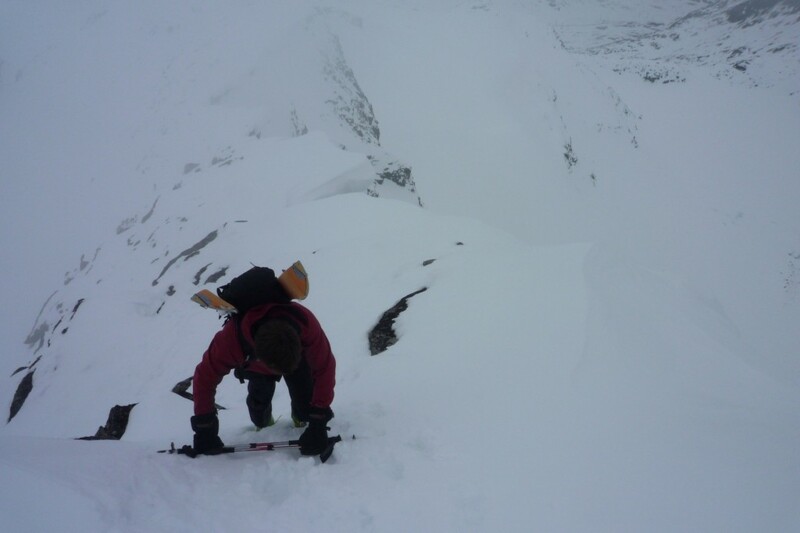 What a cracking couloir! It’s so wide when you’re in it and although I didn’t feel I could charge it with the snow conditions, it was a great descent. Highly recommended. We skied out of the fan and across the valley to ski the south couloir on Store Soleitind (see next blog post) which is clearly visible from the fan of this couloir. 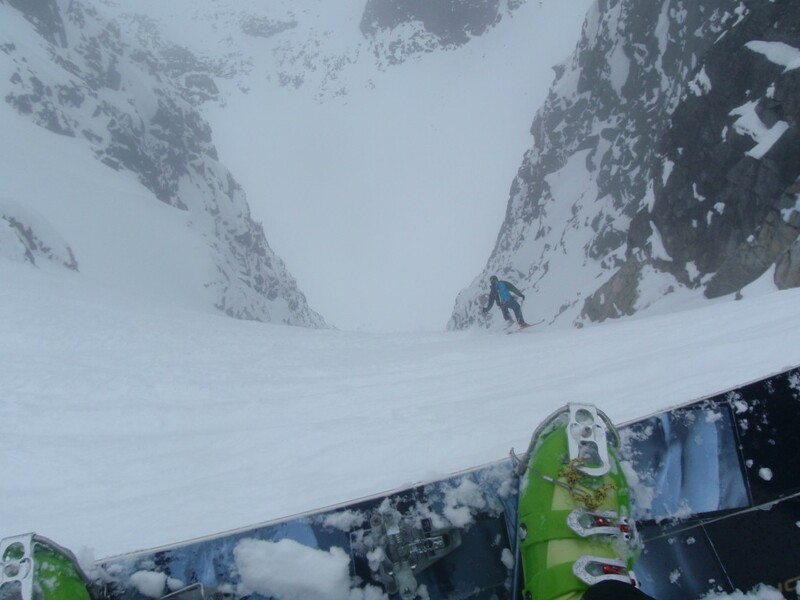 Two opposing couloirs within easy reach. It doesn’t get much better than that. This entry was posted in Jotunheimen, Norway and tagged Austabottind, Backcountry, Backcountry skiing, Hurrungane Norway, Jotunheimen, Skiing, Snowboarding, Splitboarding. Bookmark the permalink.